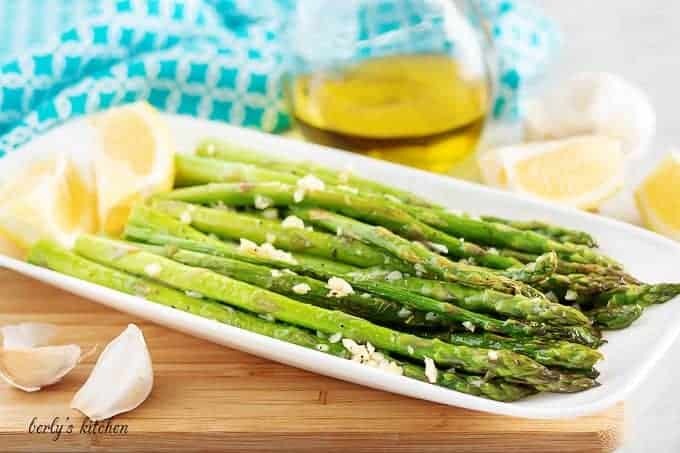 A flavorful sauteed asparagus recipe made with fresh lemon juice, garlic, and olive oil. Creating a delicious vegetable side dish has never been easier! Vegetables, whether loved or hated, are necessary for a balanced diet. Just like everyone else, I prefer to eat dishes that taste good. So, that means I avoid any and all canned veggies. However, I will use frozen versions when needed in casseroles and dishes that utilize long bake times. Other than that, I stick to fresh vegetables whenever possible. With that being said, if you don’t know how to prepare them properly, then they will be bland and tasteless no matter which variety you choose. 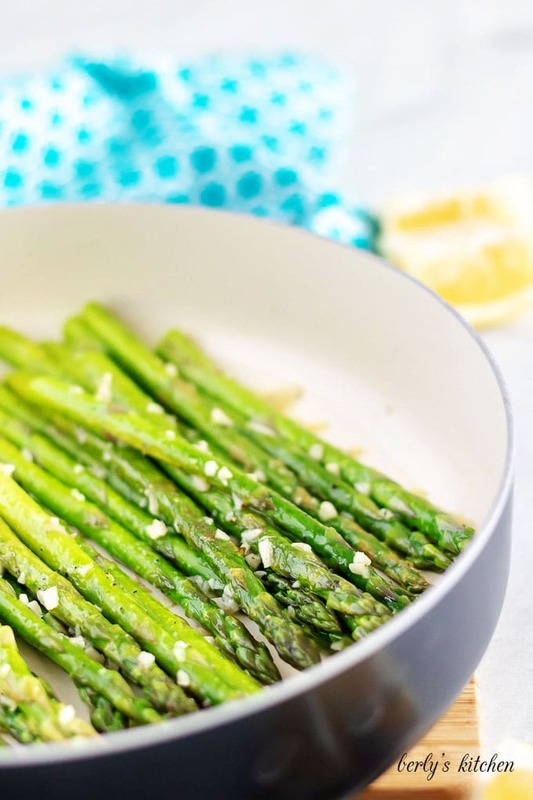 For today, we’re sharing my simple sauteed asparagus. As the name implies, it’s easy to make and, best of all, it actually tastes good. Let’s get cooking! As I stated above, our sauteed asparagus is really easy to make and takes less than twenty (20) minutes from start to finish. To begin, start by washing and drying your asparagus. Once it’s dry, take a knife and cut away the bottom third to half of the stalk. That part of the veggie is pretty much inedible. Peel and mince your garlic, juice a lemon, and grab your olive oil, salt, and pepper. Now, in a large saute pan, toss in the asparagus, olive oil, salt, and pepper. I like to toss the veggies in the oil and seasoning mixture before turning on the heat. Cook them over medium heat for about five (5) minutes. When the time is up, add the minced garlic to the pan. Use a spatula to keep the sauteed asparagus moving. Because, once the garlic is added to the hot pan, it can burn easily. Let everything cook for about one (1) minute. Afterward, remove the pan from the heat. At this point, your vegetable side dish is almost done. All that’s left to do is drizzle the lemon juice over the asparagus. The juice serves two (2) purposes. First, it gives the dish a fresh blast of lemon flavor. Second, it makes the green hue of the veggies really pop. In essence, you get a double benefit from using fresh lemon juice; wonderful flavor and vibrant colors. It’s a win-win in my book. That’s it, once the juice is added, you’re done. 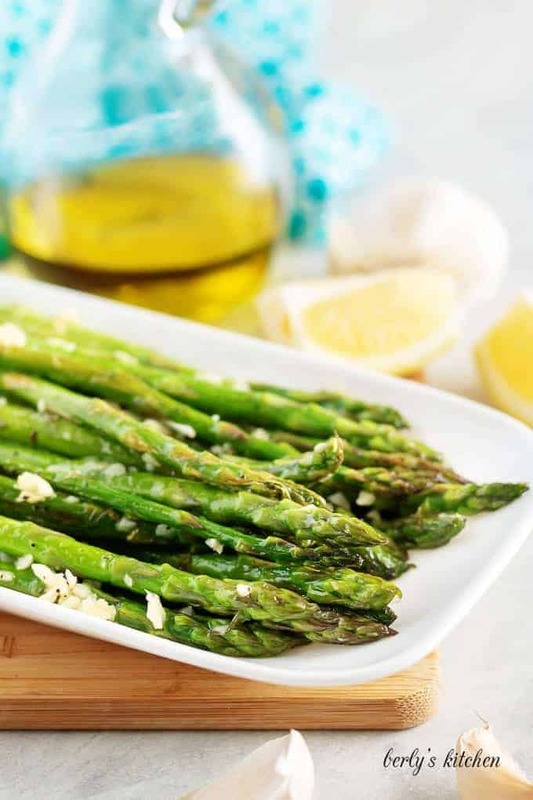 Serve the sauteed asparagus and enjoy! Try not overcook the asparagus. Otherwise, it can get mushy and will not last three (3) days in your fridge. On a similar note, don’t let your garlic burn or it will become bitter. If you don’t care for asparagus, try using the same olive oil, garlic, and lemon juice mixture on sauteed broccoli. Looking for more fruits and veggies? 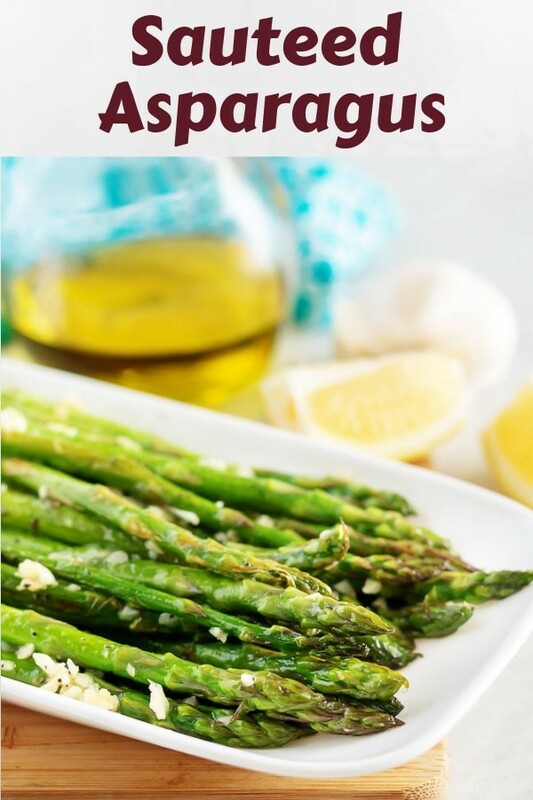 If you enjoyed our simple sauteed asparagus recipe, please leave us a comment and rate the recipe card. You can also find us on Facebook, Pinterest, Twitter, and Instagram by searching for Berly’s Kitchen! Wash and dry the asparagus. Then trim off the bottom third (1/3) to half (1/2) of the stock. It should not be eaten. 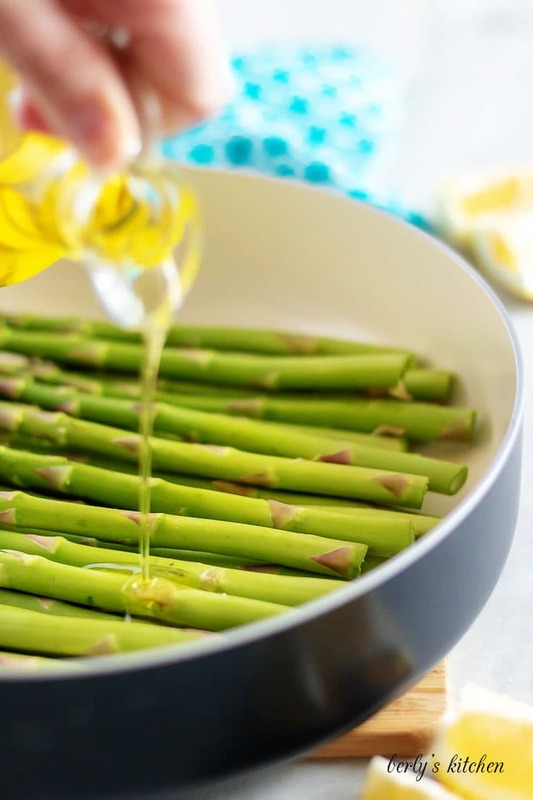 In a large saute pan, over medium heat, combine the asparagus, olive oil, salt, and pepper. Saute everything for five (5) to six (6) minutes. After that, add the garlic and let the veggies cook for another minute. Remove the pan from the heat. 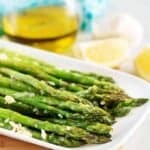 Just before serving, sprinkle the lemon juice over the asparagus and toss them to coat. Serve immediately. The calories listed are an approximation based on the ingredients and a serving size of four (4) ounces. Actual calories will vary. 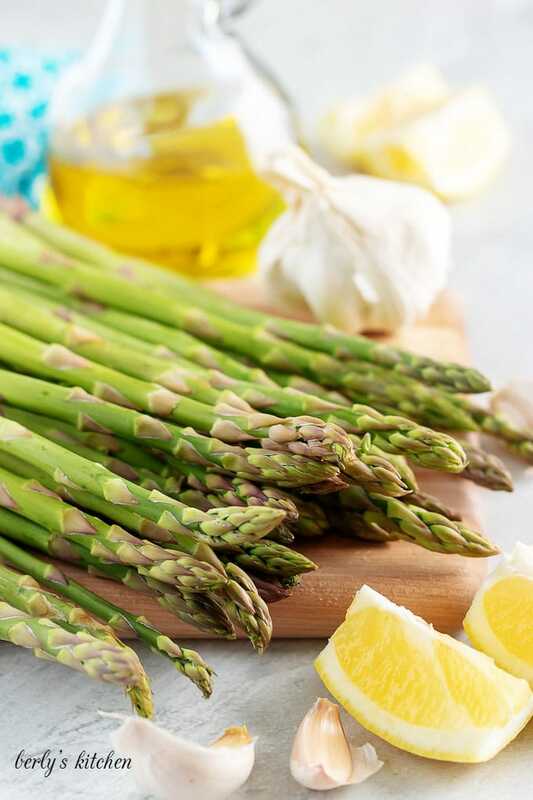 The sauteed asparagus can be stored in your fridge for up to three (3) days in a sealed container.